JULY 20 – While much of the policy debate around the conflict in Ukraine has been focused on short-term solutions such as providing lethal military aid, less attention has been paid to the broader security implications across Eastern Europe and the overall role of NATO in the conflict. This event will address why the conflict in Ukraine matters beyond immediate military and humanitarian intervention and will provide recommendations on the future of U.S. policy toward Russia. As Russia continues to intensify its presence in Ukraine and along its European border, NATO and the U.S. have begun pursuing a more aggressive policy toward Russia by taking short-term measures to increase the number of troops in the Baltic States and strengthen security operations in the region. Complicating the situation is a lack of funding as defense spending in Europe and non-U.S. contributions to NATO are at historic lows. Yet, a long-term strategic vision has been all but lost in the debate over whether to arm and train Ukraine’s military. The current crisis in Ukraine is a symptom of one of the most intractable disagreements between the U.S. and Russia: NATO expansion. The Russo-Georgian crisis in 2008 and now the war in Ukraine have highlighted Russia’s opposition to the expansion as Russia perceives it to be an intrusion on its sphere of influence. 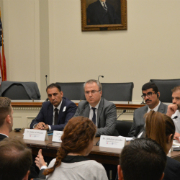 This event honed in on the purpose of NATO, the role of U.S. leadership, and recommendations for an effective, long-term security strategy in Eastern Europe. 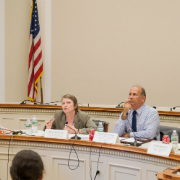 This was the 23rd event in the USIP/PSA Congressional Briefing Series – Topics on International Conflict Resolution and Prevention, an educational program designed to provide congressional staff with opportunities to engage leading experts and fellow Capitol Hill staffers in bipartisan forums. The program aims to build cross-party relationships, encourage bipartisan dialogue, and equip staff with new perspectives on critical issues in the international conflict resolution and prevention field.